One of the biggest advantages that a retail investor has over funds is that they can be in cash. Most funds, due to their mandates, must deploy most of their cash and thus are virtually fully invested at all times. As an individual investor, you don’t have that restriction. In my fourth article in the My Secret Recipe series entitled My Secret Recipe: The Bargain Rack I detail how I like to buy stocks with a margin of safety. Also, I like to take the approach that Warren Buffett stated when he said: “I don’t look to jump over 7-foot bars: I look around for 1-foot bars that I can step over.” I like to buy when I have great conviction and not when I have low conviction in an idea. Because I am very patient in this regard, I find myself sitting in cash often while I wait for my pitch. The following graph shows my cash percentage over time superimposed over the Russell 2000. My cash position has varied widely from roughly 10% to 80%. 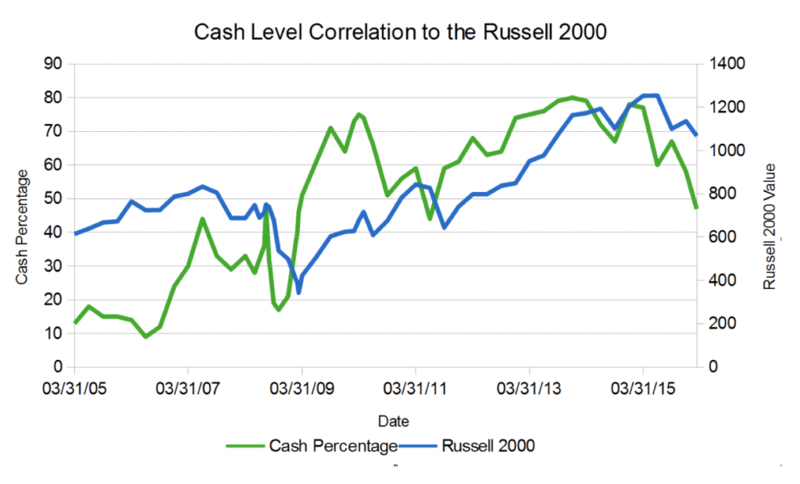 The correlation between market performance and cash levels is quite strong. That is, when the market is moving up, my cash levels tend to go up as I sell stock, and when the market is going down, I tend to buy stock as bargains present themselves. I do like to keep some level of cash at all times as I prefer not to need to sell stock to pay bills. The correlation with the market is best illustrated by talking about some examples. My cash level started steadily rising starting in fall of 2006 and hit a peak in August of 2008. It was at a level it had never seen before. I deployed cash during the coming months after August 2008 as the market plunged. I was early in deploying cash but the point wasn’t to time the market. The point was I saw attractive opportunities and purchased those attractive opportunities. As we all know, the market bottomed in March of 2009. As the recovery progressed, I saw my cash level steadily increase into 2010. Cash hit another peak right around spring of 2010 which is right around the time the Russell 2000 hit it’s first major peak post crisis. I then saw my cash levels start to decrease. Berkshire Hathaway, run by Warren Buffett, is also known for using their cash position judiciously. 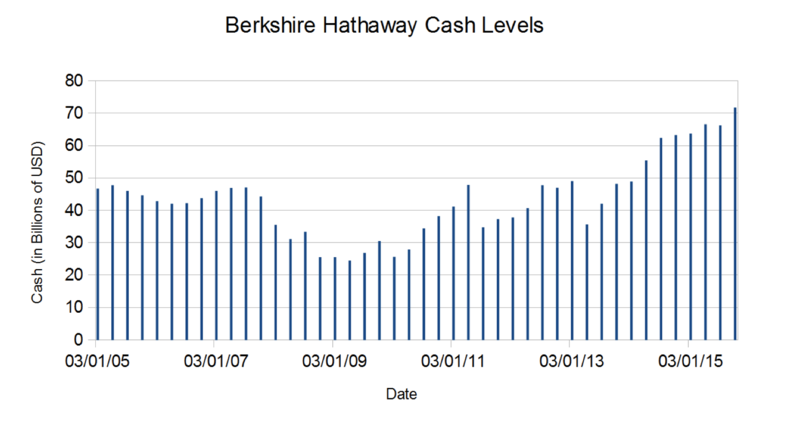 Below is a graph that shows the cash level held by Berkshire Hathaway. Note that it bottomed in June of 2009 just after the market bottomed and has been growing ever since. Warren Buffett uses cash very strategically. Since he is going after larger companies and has to do it in big chunks, he is hunting for whales as compared to my guppies. So, the way he deploys cash is different than me but the point is the same. That is, cash is a position that can be used strategically when the time is right. He doesn’t wake up in the morning and think, I have cash that I must deploy today. Over the past few years my cash has been at more elevated levels. There just haven’t been that many opportunities in the microcap space as the microcap space got overheated. In fact, the Russell 2000 had an astounding 38.6% return in 2013 and is now lower than its level at the end of 2013. Additionally, the Russell MicroCap Index was up 45.2% in 2013. Given the lack of opportunities, I sat patiently and waited. However, since early 2015 I’ve started to see my cash level decrease. Assuming the trend continues, and I think it will, I’ll soon be at cash levels that haven’t been this low since 2009. I’m simply seeing a lot of opportunities right now and I haven’t seen much in a long time. Of course, all of my due diligence on these companies can be found in the company discussions on MicroCapClub. My cash position over the past decade has helped me to magnify my returns. My strict discipline helps me to improve the odds of making money and not losing money. Now I may not make the most money during periods of blow-off tops in the market but I also lose a lot less in market contractions. Using cash has helped me to obtain market beating returns of around 23% annually over the long haul (Jan 1, 2000 to March 10, 2016). That return includes cash which means that my return on invested capital has been considerably higher. Now I’ve heard people say that there is no excuse for cash. You can always short stocks. MicroCaps are very difficult to short for technical reasons (e.g. difficulty of borrowing) and also are very dangerous to short because it is quite possible to have a bullish PR come out of left field that results in a huge upside move in the stock. There have been a few times where I used shorting on larger companies but they have been few and far between. I find it difficult to be both an expert in microcaps and watch larger companies at the same time. Some people will look at this article and say that I’m market timing. While that may be true indirectly, it isn’t something that I am doing directly. I don’t wake up in the morning and say, I think the market is going to be down over the next six months so I’ll sell stocks. I simply buy companies when their valuation and future prospects look attractive and sell them when the valuation looks rich relative to their future prospects. This approach helps me to buy when the market is pessimistic and sell when the market is overly optimistic. While my cash position does have a strong correlation to market performance, I don’t proclaim that my cash level is perfect or that people should even try to correlate their cash level to market performance. I simply try to buy companies when they are priced attractively and sell them when the risk of owning them outweighs the potential return. The number and quality of attractive opportunities that I see may not always correlate to the market. One reasons for this is that there are companies that outperform in times of market contraction. Also, there are companies that have minimal economic sensitivity. I do find that the number of attractive opportunities does seem to correlate quite well (inversely) with general market performance. The hardest part of having cash is being patient. I derive my income from the stock market and it is hard to make money when I am lightly invested. I have to force myself to sit on my hands. On the other hand, buying when everyone is pessimistic is also difficult. I remember posting online in late 2008 that I was buying and feeling like I was talking to myself. Being contrarian isn’t easy emotionally. Many individual investors use cash in exactly the wrong way. They try to market time and capitulate when the pain hits the maximum level. Conversely, they get sucked into the stock market when everyone is making money and buy near the top. Instead of buy low sell high they sell low and buy high. Mastering your emotions is an important part of investing that every investor must do. Now, just to be clear, I generally buy growing companies. So, don’t take this article as I just try to buy solely based upon valuation. If you want to read more about my approach, I suggest reading the entire My Secret Recipe series including: My Secret Recipe: The Index Card, My Secret Recipe: Shopping and a Taste Test, My Secret Recipe: Inspecting the Ingredients, and My Secret Recipe: The Bargain Rack. I think it is important for individual investors to realize that cash is a valid position. You shouldn’t feel like you need to deploy all of the cash siting in your accounts. As Waren Buffett famously stated, “There are no called strikes in investing.” It is possible that most ideas are not attractive and they should be tossed in the”too hard” pile as Warren Buffett and Charlie Munger often do. You don’t have to swing at pitches that are barely in your strike zone or just outside. If you play things right, your patience will be rewarded. Mike, I really enjoyed this article because it dives pretty deep into your strategy which is quite different from mine. I don’t think I’ve ever had more than 20% cash let alone 80%. It’s the perfect example of finding a strategy that fits your personality and objectives. The willingness to sit at the plate and wait for your pitch is universal. Thanks Mike for wonderful article ! Fascinating and useful. Thank you Mike. Great article in my old job we also employed the same strategy to great effect. One thing mike you could elaborate on is how to maximise you returns on cash. We just to ladder TD out 6 months with TD rolling over every other day. It took a bit more effort but at least we got a higher yield than just leaving it sitting in our brokerage account. Be interested to hear your thoughts on what you do when you have a lot of cash. I haven’t done much to enhance yield. Once or twice I purchased a short term CD with some of the cash. With interest rates so low, the additional yield isn’t much. My concern has always been that I didn’t want to take the risk that I would need the cash. You never know when the opportunity will come. I suppose I could always put the money in a CD and just take the early withdrawal penalty if I need it. As you mention, laddering would be the way to go. Great article Mike. I have a question for both you and Ian and this is about adding to an existing position. So do you guys only average up or do you also buy when the stock is down? It seems like adding to an existing position when you see that management is executing makes a lot of sense. It also makes sense to add when the stock is down if there is no fundamental reason for going down, but it tends to be more difficult for psychological reasons. Will, I probably average up more than I average down. Generally the only time I average down is when the story hasn’t changed and the stock price became cheaper. In the end it all comes down to buying with the proper risk/reward ratio.